If I use a mechanical aerator and it leaves a mess of dead grass ATC. Can I use the mower to hoover it up or will it compact the slits again? If not what is the best way to clean up and leave it looking half decent? Reply: A blower or leaf blower can be used to collect the debris so long as it is not too bulky. Use a mower to collect the final scraggy bits and trim the lawn ahead of the next stage. Excellent article! 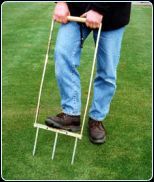 This is is great guide on how to aerate your lawn properly. Goes to show that a beautiful lawn does not come without some effort. So make sure you know how to aerate to better take care of your turf/lawn. Thanks for sharing! Reply - thank you. Tell your friends! Are shoe aerators any good? Reply - they are tricky to use and you feel a bit of an idion stomping over the lawn in my view but for small areas, ideal and better than nothing! Reply: Sorry, but this question is not making a lot of sense! Do ytou mean Turves from a different source? Never thought or even heard about the term "aerating the lawn". I have religiously watered and sprinkled fertilizers though. Your entire write-up makes complete sense, as you have scientifically explained the reasons behind it. Better informed now and hopefully will get better results with my lawn. Our lawn is on sandy soil in Norfolk. There is a lot of thatch despite regular scarification ie twice a year. It feels spongey with a lot of moss. I have aerated it with a garden fork. It has been weeded and fed regularly too. It looks awful as it has gone brown already this year with only a couple of hot dry days. Final blow today after a day of rain there are approx a dozen ant nests with the fine nest soil mounded everywhere. I despair. Should we take it up and start again or lay it to shingle - I am that fed up with it! Reply - search the blog for 'How to renovate a lawn' to come up with the flow chart of what to do. If you sink when you walk on the lawn, you need to reduce the volume of the vegetation then renovate the lawn. Hello, how do get decent grass under three large beech trees, presently it rubbish and I have seeded twice. Reply - Keep over seeding it as it is often the drip, drip of water off the tree that literally wears the grass out underneath not always the shade etc. Spread some recycled 0-10mm compost / soil conditioner to put some goodness back into the soil and over seed it and keep it well fed. NEver mow it low. Once you get some grass growing, over sow it again as the grasses present will help new seed to establish by protecting it. Or give up and plant some grond cover plants. Reply: Best to fertilise it as there will not be a lot of goodness in the rootzone. See fertiliser products in www.thelawnshop.co.uk also poultry pellets or recycled compost is rich in organic matter and humus which will get it all going. Also over seed it if bare. I had no idea that exposing soil to oxygen could help improve the quality of your lawn. I was always confused as a kid, as to what all the dirt clods were on the lawn, and why adults would poke holes in the grass. Now I understand that it really does help with a variety of things. Like you listed, it not only helps nutrients uptake, but it improves drainage. This is especially helpful for me because I live in an area that is easily flooded. Reply: You can aerate monthly should you wish. If you want to aid water percolation back filling with a sharp sand or grit would be ideal. I found this post very worthwhile for me. 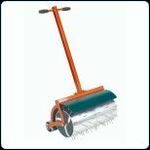 Thanks so much for giving me ideas on how to aerate our lawn.I did really enjoy following the above steps mentioned. And now, I know the advantage of doing this. I have been aerated my lawn with a fork annually, hoping to relieve compaction and increase drainage. This doesn't seem to be working, in fact I can see no improvement to compaction, drainage or the grass. The soil type is deep heavy clay. I noticed that my local council, at a nearby park seem to have given up their aerating policy, although still scarifying, in lieu of aerating, annually in December, spread course, sharp horticultural sand at a high spread rate of around 5lts per square metre or more, sufficient to almost cause surface obliteration, spread on winter height lawns. The quality of their lawns is high. I wondered if this is a more modern approach to dealing with issues of increasing drainage and aeration, in heavy clay conditions? Is it worthwhile giving this idea a go? Using mealworms or earthworms for my sad Bermuda lawn sounds really appealing. Do you have any advise or comments of any kind about this? I would appreciate hearing them. Can you tell me the benefits of manually sanding a waterlogged playing surface (wheelbarrow, shovel and 3 ton of sports sand) It's a council run rugby pitch which is ridiculously over used in all types of weather, there is lots of good grass coverage left but down the flanks are trashed, we load our barrows up, get on the field and throw sand over the bare and boggy bits. Reply - aeration is the key, surface and deeper types. Sand only soaks up the surface water. The council need to get it verti drained (deep aerator) and over sown with grassed. Spreading sand is a short term fix for their lack of maintenance sadly. Our groundsman keeps throwing sand on the boggy goalmouths, all it does it make a sandy, boggy mess, will this kill the grass, cos it seems to be taking an age to dry out and no football can be played. Reply - sand is a quick fix to soak up the water. Deep aeration in and out of the season is the key to getting the water away. If you dig down in the boggy area, the water retention will only be a few inches in the surface. Use of a garden fork for locolised deep hand aeration is good too, as is trying to retain the grass. Thanks for sharing this. Compaction is a serious issue that many people choose to ignore. It's a shame because usually they end up costing themselves an arm and a leg reseeding their entire lawn when all they needed was an aeration. Reply - It is a customer theme and we purchased the artwork. i am an amateur greenkeeper. Is it recommended to use a moss killer fertilizer 2 weeks before hollow tining greens and also should i use fertilzer (autumn type)afterwards ( 2 weeks later) thank you. Reply - Kill any weeds and moss, leave two weeks then scarify, aerate, over seed and fertilise and top dress. I am having a problem with a fellow thats complaining that I didn't do a good job aerating his lawn. He didn't see it until 2 weeks after it was done. How long does it take for the aeration to disappear? Reply - until it rains usually. I have just removed hundreds of dandelions with often 4 to 6" roots all by hand using a screw driver it was very very slow. I now have plenty of holes in the grass. I note you comments to fill any patches or holes in the lawn with sand followed by grass seed. From that I am to believe this will replace the Dandelions and the lawn will begin to breath again? Reply - Soil and seed. Not sand. Use Evergreen Lawn Dressing or your own sifted compost. The material has to be light enough for the grass seed to grow through. Sand in a hole will be too heavy and cap over. Is it OK to aerate the the lawn during spring & should I water the lawn before doing so? I have over looked aerating my lawn for years. My wife started to do it around 6 months ago and we noticed a massive difference in the roots of our plants. To anyone that is sceptical, I'd say give it a go... You may be surprised as to how much it can help! I want to aerate lawn with a flat blade tine rotary machine, is it too late? With slightly warmer temperatures I'm worried the new grass 'shoots' are growing already and they will be cut off. Reply - It would be fine to aerate your lawn now. Reply - read the article How to Renovate your Lawn as it will give the flow chart to follow. We had a new turfed lawn at the rear of our house around 4 years ago. The first 2 years we fed and looked after the lawn really well, it was always lovely lush and green. We carried out the same the last 2 years, but noticed dry straw looking patches. The lawn was still green around these areas, not it seems the straw looking grass is taking over the whole lawn. Now winter is setting in, looking through our top window. Our lawn looks awful, all other neighbours look green. We have no pets, we have tried our best, really worried its going to look really bad next summer. Love a nice lawn and its only a small lawn. Please can you give me some info on what you think as happened. Reply - It sounds like Red Thread to us! If the areas are dry underneath is may be Dry Patch. If you can lift the turf in the affected areas do you have Lawn Pest Larvae? Reply - Try The Lawn Shop. 'Mossguard' product in the hard surface moss removal category. Nothing like it! I have a very wet lawn that Feels very spongy. I have dug some trial holes to see if I have a high water table and it appears not. So I then filled the hole with water and the drainage is poor. Will aerating the lawn with mechanical aerator help or do I need to lay French drains? I would rather aerate !!! Answer - See our post on Lawn Drainage in response to this question. I recently laid new turf to my lawn back in September. Over the winter I built a shed and have walked over the grass many times. My grass now has patches of areas that don't seem to want to grow, should I aerate the lawn and hope it begins to grow again? I don't want to add new seed as the turf was of good quality. Reply - Tpye in the keywords of Dry Patch and Wetting Agents. If the soil is moist in the bare areas, over seed the areas and try and change your walkway to help it recover! We have a very soft and sponge like lawn, I have used a fork with 6/7 in spikes and can very easy push all the way down into the lawn with ease. The soil is very clay like and wet is it best to hollow-tine aeration the lawn? Reply - solid tine or hollow and try and get some organic matter down the holes like recycled compost or something like Miracle Grow Lawn Dressing or equally sharp washed sand to ameliorate the clay soil with a different soil that will aid soil texture improvement. Grass roots make good aerators so feed the lawn too to encourage deeper roots. I think this time of the year (fall) is the best time to aerate right before winter. I like to overseed at the same time. I believe that some seeds make it into the holes in the ground and don't get washed away if it rains heavily. Here's a youtube video I posted of the aerator that I built from stuff laying around my garage. I think it works pretty well considering I probably only invested about $16 in making it. Reply - excellant and thanks! Hi, I am in desperate need of advice on my lawn.My lawn is aprox 40 feet long by 20 feet wide, it is level for 3/4 of its lengh and then slopes off fairly steep. on the slope it is wet,so much so I have marsh marrigolods growing in it! on the flat the grass is very slow growing if at all. The ground is absolutly rock hard, I weigh 15 stone and I have to jump on my fork several times to get it in. Also if I were to rake out all the moss ect I would vertualy have no lawn at all! so I ask, do I aerate it? or digg it over and start again? I am in the north west UK. Reply - Matt, the fact that the ground hard might be due to the lack of rain. Go to the search facility and type lawn renovation. The technical post that comes up starting 'I am often asked...' will outline the renovation process flow chart that you need to follow to get your lawn back in shape. Kill the moss and weeds as you do not need them, only grass and be cruel to be kind! Also look at the Dry Patch technical leaflet. Hiring a Kango from the hire shop and making holes every half metre and back filling with pea gravel almost to the top provides some severe aeration especially to catch water at the bottom of a slope. Groundsmen will always fertilise poor turf just to see what they have left to play with too. Hope this helps. The aim is to turn the lawns to only have grass in them. Your help and advise would be much appriciated.